It’s no accident that the Slow Food movement originated in Italy, where the concepts of good, clean and fair are engrained in the nation’s culinary traditions. However, the country has not been immune to shifting consumer trends, most notably, perhaps, the rise of larger-scale one-stop retailing. 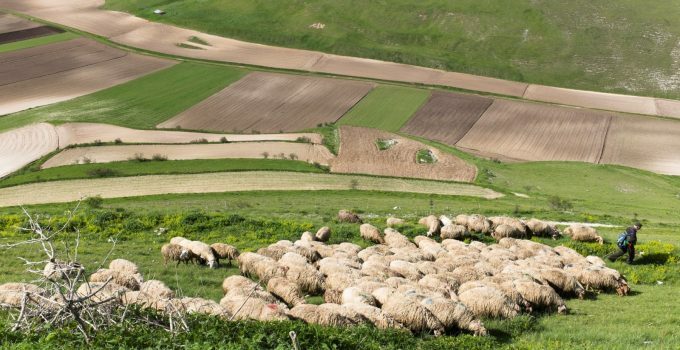 This article describes how traditional food practices have been assimilated into the modern economy in Umbria, Central Italy. It argues that mainstreaming “Slow” is key to better, more sustainable food systems, and that rapidly changing retail systems in the UK may present opportunities rather than threats for positive change. Weekly local fresh food markets are “farmers’ markets” by default, with most of the produce being supplied locally, often from stallholders’ own plots and those of their neighbours. They are not the niche, specialist and high-end affairs that UK farmers’ markets can sometimes be but are mainstreamed into everyday food shopping alongside, and sometimes instead of, large retail outlets. These generally small and simple outlets for surplus produce are supplemented by a national network of Mercati della Terra (Earth Markets), a Slow Food initiative in partnership with local authorities, and other more specialist markets. These have broad appeal to locals as well as visitors and provide a year-round social space in addition to direct sales opportunities for producers located within 40km of the market. 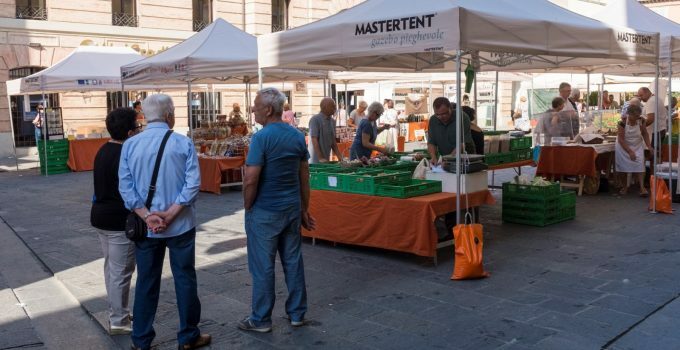 Despite a declining economic climate, research has reported that Italian consumers are willing to pay a premium in outdoor markets, greengrocers, butchers, fishmongers and organic food specialists (although these are not necessarily more expensive than supermarkets, and often cheaper) for higher quality, greater authenticity and product knowledge, and the warmth and sociality that characterise small-scale local shopping. Direct sales from farm outlets are very common, with the shortest possible supply chains maximising profit for sellers while keeping consumer prices low, and encourage interactions between shoppers and the producers of their food. 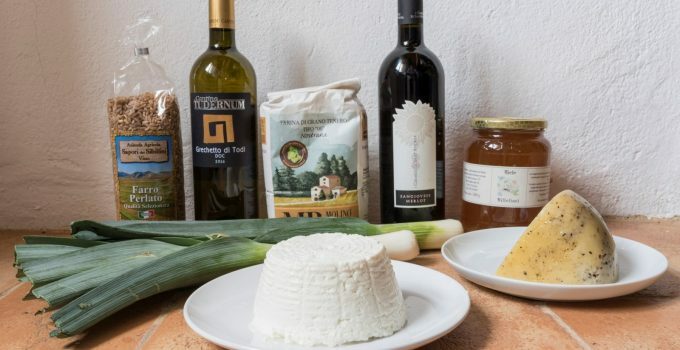 Products that can be purchased at source include wine, olive oil, lentils, grains and pulses, fruit and vegetables, honey, dairy produce, preserves and condiments. They are also stocked by local restaurants, food markets and small retail outlets, offering suppliers multiple sales channels and a wider distribution network. In addition, supermarkets stock a large range of products produced regionally, and often within a few miles, alongside branded and own-brand items. This is in contrast to the evolution of large-scale food retail in the UK, from the dominance of the distribution centre model to the growth of digital trade and the convenience sector. Food production is a large tourist draw, with permanent itineraries, for example wine and olive oil routes, that are slickly branded and heavily promoted. Individual towns are strongly associated with iconic local products. This is manifested in annual sagre, seasonal food festivals during which even the smallest villages host multi-evening events with menus featuring their chosen product(s), serving locals and tourists alongside programmes of entertainment and raising money for community organisations. In several cases, festivals that had begun to die out as local interest waned have been resurrected for the tourist market. There are also larger-scale festivals celebrating products such as saffron and truffles, and tourists can pay to visit farms, vineyards and olive groves, diversifying income beyond food sales and promoting products to a wider audience. There are strong links among farmers, restaurants and accommodation providers, often with the opportunity to have products delivered to visitors’ homes. In addition, national park and protected area authorities actively promote distinctive local foods, partly to increase the breadth and attractiveness of the tourism product, but also to foster buy-in from local producers, who may otherwise resent restrictions that may be placed upon economic activity in environmentally sensitive areas, and/or reduce conflicts between environmental management goals and food production – a notable example is the reintroduction of the Apennine wolf in livestock rearing communities. A visit to a typical provincial Italian supermarket can be a frustrating experience for the “world cook”. Italian food culture is notoriously conservative and the tradition of seasonal cooking, along with a lack of demand for “exotic” produce, means that those accustomed to almost unlimited year-round choice of global products in larger UK stores can be disappointed. However, embracing seasonal supply rewards the buyer with the freshest local food and larger retailers, led by Coop Italia in market share, have strategically invested in emulating the environment of fresh food markets. In addition, loyalty scheme members are able to take advantage of seasonal discounts when products are abundant, for example special offers on bulk olive oil purchase following the autumn harvest. Debatably, part of the limited legacy of Milan hosting the disappointingly corporate 2015 Expo “Feeding the Planet, Energy for Life”, was that Italy subsequently passed a new law making it easier for supermarkets to do what traditional markets had been doing informally and donate waste food to charity, offering tax breaks and stripping away red tape. The strongly regional nature of Italian food production is enshrined in intellectual property protection and monetized through the Denominazione d’Origine Protetta (Protected Designation of Origin; DOP) and Indicazione Geografica Protteta (Protected Geographical Indication; IGP) classifications, guaranteeing that all (DOP) or some (IGP) of the production processes, giving the product a particular quality and characteristics, have taken place in the place of origin. The designations give buyers confidence in quality and providence, and empower producers to generate additional value in marketing. 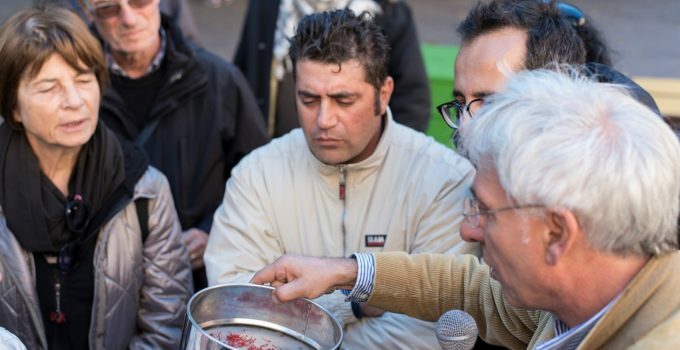 Italy’s “slow food by default” culture is mainstreamed into everyday consumption, and supported by strong traditions and proudly regional food cultures, which lend themselves to integration in cultural events and tourism, and to formalisation through protected status denominations. In addition, online shopping and the convenience sector have not assumed the same importance as in the UK. However, while Italy may have had a head start in Slow consciousness, there is plenty of scope for similar progress in the UK. For example, Norfolk, my own home county, hosts six distinctive Ark of Taste products, has a small supermarket chain with an emphasis on local suppliers, is home to a growing community of talented chefs specialising in regional produce, and has numerous direct sales outlets. So, perhaps the primary challenge in taking the Slow agenda forward is in mainstreaming it into the dynamic modern economy by embracing trends including online and convenience sector growth and identifying the opportunities offered by these channels, as illustrated by the evolution of organic box schemes to offer online ordering, for example.